We’re excited to announce we exceeded our goal! 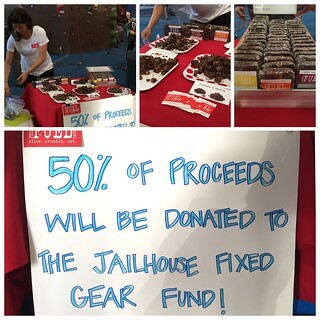 In just one night, we raised nearly $1500 for the Jailhouse Gear Fund! With Planet Granite’s $1000 match, almost $2500 was donated to purchase the much needed gear to replace the fixed gear at Jailhouse. Jailhouse is an almost entirely fixed gear crag, meaning every bolt has a fixed draw. The fund will be used to buy bolts, hangers, steel carabiners, static ropes, and other gear to replace worn and broken equipment, keeping the crag accessible to all. 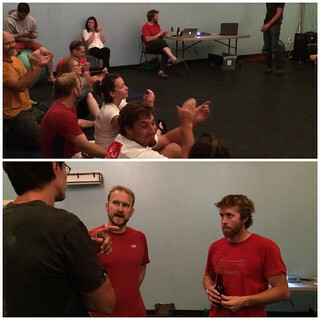 Special thanks to James “Peaches” Lucas, best known for living the dirtbag climber’s dream, for hosting a cool slideshow for our event. 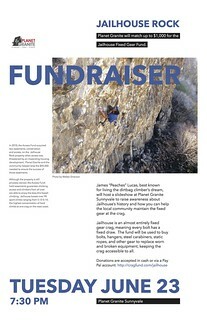 He detailed the history of Jailhouse and his vast collection of photos from the crag throughout the years. We had a special treat with guest visitor, Fitness Fuel Eats! Founder Shaghig brought tons of tasty samples to try and donated 50% of her proceeds to the fund! Thank you again to everyone who donated! Our members make Planet Granite’s $1 per Member per Month a successful program in which we’re able to donate money to protect and preserve crags like Jailhouse. Read more about PG Gives Back here.